Pu-erh tea is an aged and fermented tea whose leaves have been packed into “bricks” of various shapes and sizes. Presenting aromas of light smoke, caramel, and hay, pu-erh is ideal when steeped or infused to a degree where much of the color leaches into the final product. Even better, its aromas lend themselves very well to almost any aged spirit, from Añejo Tequila to rye whiskey to dark rum. Fernet Vallet is a 70-proof Mexican bitter liqueur with flavors of kola nut, a host of herbs (including mint), and an almost caramel or maple syrup sweetness. 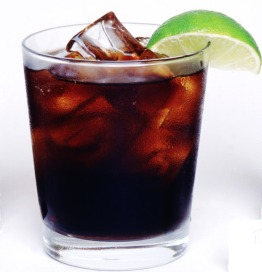 It's density of color is amazing – an ounce of the liqueur will color 16 ounces of water entirely black. Fulvic acid water, readily available under the brand name BLK, can serve as a medium for incorporating a variety of flavors into syrups and other preparations. However, its density of color is perhaps the weakest of the three items presented here, meaning that adding simple white sugar can create a color closer to gray. For this reason, I recommend using dark brown sugar for any syrups made with fulvic acid water. Build all ingredients in a small rocks glass, stirring to dissolve the salt before adding ice and stirring to chill. The Black Skies is inspired by the views of the many cities which I've been privileged to see at night – as the lights go down, all that is left in the dark of night is a black sky. Deeply flavorful, this inky-black take on the Toronto serves as a wonderful transition into the cold days ahead of many of us. for an explanation of this alternative acidic ingredient and a recipe template for producing it. Take your pick of the listed spirits to create interesting variation in the drink while paying homage to whichever end-of-the-month tradition seems most appropriate. Feel free to use the maple syrup/Fernet Vallet combo as a sweetener and the pu-erh agrumes as an acidic component in any cocktail whose template calls for it, allowing you to create and use black drinks not only in this season but in many more to come. Until next time, cheers.